Product information "Actioncam with 4K camera (UK Version)"
The Typhoon Actioncam combines the impressive CGO3 gimbal camera with an effective handle that stays level regardless of movements, shaky hands or wobbling, in turn, the CGO3 gimbal camera ensures stable videos and photos every time. Thanks to ultra-high definition (UHD) video resolution, 4 times higher than HD, the Actioncam delivers high-quality video recordings with 4096 pixels and at 25 images per second, and 12-megapixel photos. It also has the ability to capture slow motion at 120 images per second with a video quality of 1080p/120 fps. Capture life in 4K with detail and realism. 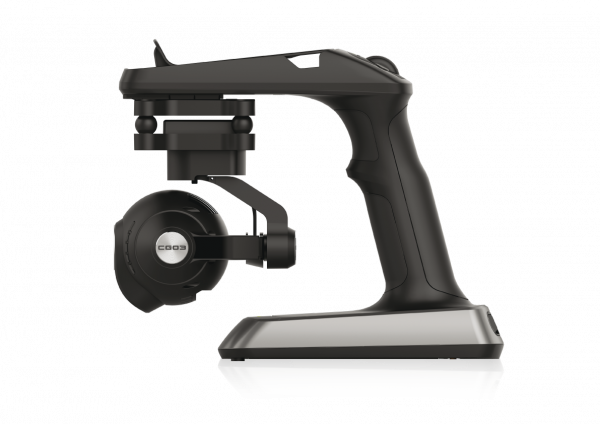 The camera pitch controller enables precise camera angle control and is conveniently placed where the thumb naturally sits on the ground handle for easy control on the go. Typhoon Actioncam with its rechargeable battery, charger, CGO3 camera and gimbal holder are all protected within a stylish and durable custom carry case. This ensures when you travel to tell your next story, your equipment will remain in good condition and be ready to shoot your next epic adventure. The CGO mobile APP allows the Actioncam user to capture images, shoot videos and control the CGO3 gimbal camera via the smartphone touchscreen. The app is free for iPhone and Android. Related Links "Actioncam with 4K camera (UK Version)"